Well loved and maintained home in the desirable private community of Goose Point Estates. 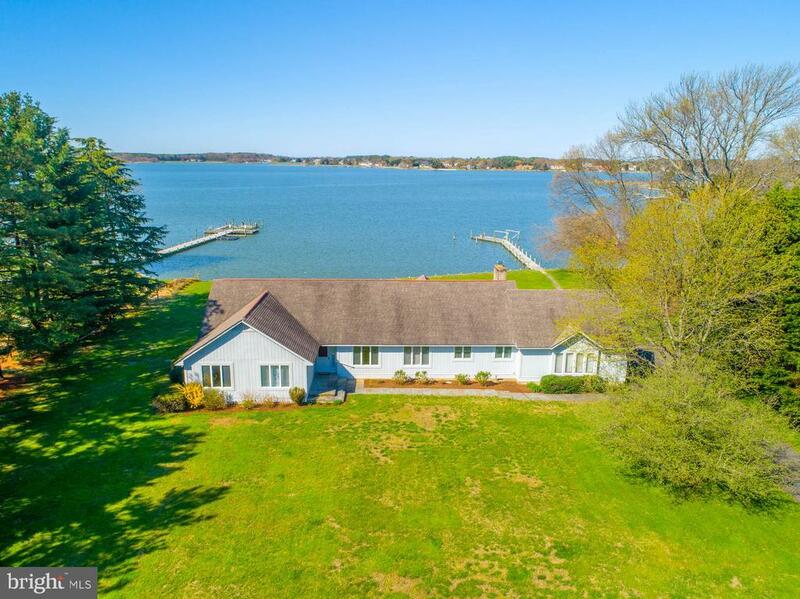 Ideal location on Kent Island. Located on Shipping Creek with easy access to Cox Creek, Eastern Bay and the Chesapeake Bay. The first thing you will notice when you enter this community and property is how peaceful and quiet it is. As you enter the home the first thing that grabs your attention is the incredible view. There are lots of windows to allow you to take full advantage of the views. This home offers easy living with close to 2400 square feet all on one level featuring 4 bedrooms and 2 bathrooms. Large living room features cathedral ceilings, wall to wall windows and a wood burning fireplace. The master suite has direct water views and access to the deck. You will spend lots of time on the large deck and spacious screened porch which are perfect for entertaining or just to enjoy the peaceful surroundings and the abundant wildlife. Dont miss the therapeutic spa room with large hot tub and great waterfront views. Beautiful level 1.6 acre lot with sweeping views and over 200 feet of waterfront with bulkhead. Private Pier with boat slip (sling) is perfect for fishing and crabbing or to relax and enjoy the sunset. A few other special features include New septic installed in 2009 - Best Available Technology (BAT). The bulkhead was recently improved - 12 Foot tie rods were replaced. Central Vacuum, convenient interior access to crawl space, 6 thick exterior walls, 220 Volt outlet in the oversized attached 2 garage, chair rail, owner said waterfront pool is allowed ~ Buyers to verify with county for approval. Commuters Dream - Approximately 5 miles to the Chesapeake Bay Bridge with easy access to Annapolis, Baltimore and Washington DC. Directions: Exit 37 off Rte 50 onto MD Rte 8 toward Romancoke - Turn left on Batts Neck Road -Approx 2.2 Miles home is on your right.